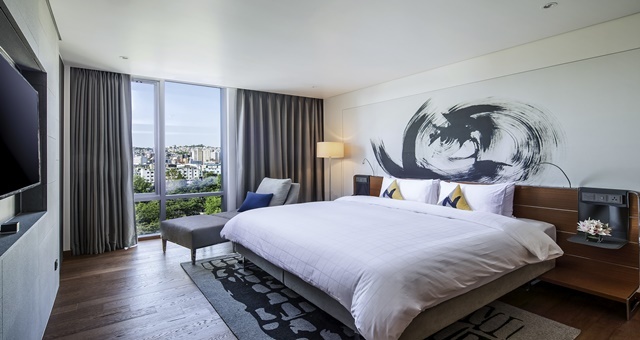 A new chapter in the story of Novotel has begun with the brand’s first mixed-use development coinciding with the opening of its 500th location worldwide in Seoul, South Korea. Combining a traditional hotel with residences for the first time ever, the new Novotel Ambassador Seoul Dongdaemun is a newly built complex offering 331 hotel rooms catering to leisure travellers and 192 studio and one-bedroom apartments as well as both short and longer-term business travellers. Rooms are available configured with either one, two or three beds. State-of-the-art technology is a cornerstone of the milestone Novotel. Guests are given a smartphone pre-loaded with hotel information and local maps to use during their stay, as well as speed dial functionality to phone or message the hotel from wherever they are. Upper category rooms from deluxe and up also feature the GIGA Genie voice control system which allows guests to stream music and access customisable features such as temperature controls, a mobile concierge and service request functionality. Lower category rooms can access the same controls through QR codes scannable through the iStay smartphone app. For those with an electric car, the hotel also offers several recharging stations. Room and public space design has adopted natural and culturally significant Korean elements such as Korean flamed finished granite stone and timbers in the flooring and walls. Heunginjimun leaves motifs can be found throughout as well. The hotel also features an indoor swimming pool on the 20th floor, fitness centre and Kids Club for younger guests to enjoy. Reflecting the hotel’s and Korea’s multicultural scene, dining options include an all-day Food Exchange serving Korean, Japanese, Chinese and Western-style food, while the Gourmet Bar offers French-inspired cocktails. In addition, a rooftop bar overlooks the city skylines. The new opening is the 500th Novotel branded hotel across 58 countries worldwide. More than 140 of these feature in the Asia-Pacific region, with eight in South Korea alone.